Custom Signage in New York, Etched Glass Signage NYC, Banners New York, NY, Signs New York, Window Graphics NYC, Decals New York, 3-D Signs NYC, Wayfinding Signs New York, NY, Architectural Signage New York, NY, Sandblasted Signage NYC, Laser Cut Signs NY, ADA Signage NY, Building Signs New York, Construction Project Signage NYC, Engraved Signage New York, Metal Signs NYC, Plastic Signs New York, Vinyl Banners Mesh Banners New York, NY, Sign Stores NYC, Sign Companies New York, NY. Signs Visual Industries, Inc. is the premier leader in custom fabricated interior and exterior signage solutions for all industrial markets in New York which include corporate, financial, hospitality, retail, construction, education, healthcare and commercial. 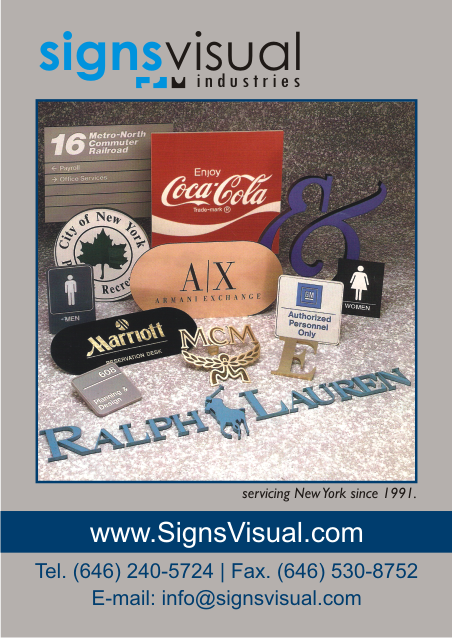 We specialize in manufacturing high-end signs and visual display systems for all markets in New York City. Our customized sign products include: Window Graphics, Etched Signs, Laser Engraved Plaques, Silkscreened Signs, Cutout Letters (Brass, Steel, Aluminum), Illuminated Signs, Lightboxes, Digital Printed Banners, 3-D Signs, ADA Braille Signs, Office and Directory Signage, Sandblasted Signs, Pylons, Etched Glass Signs, Flags and Decals, Cast Letters and Plaques, Sign Design Services, and Installation in New York City. Quality Service, Reliable Experienced Staff, We stand by our production and provide you with the best finished product in a cost effective solution. Signage New York, Signs NYC, Sign Stores New York, 3-D Signs New York, Custom Signage, Door Signs NYC, Building Signs New York, Etched Glass Signs NYC, Brass Signs, Exterior Signs, Awnings NYC, Lightbox Signs NYC.